February 27, 2018 - 8 pm @ IL Kino. German premiere. The film follows three comic-dramatic stories set in Mumbai. The first one is about a middle-aged man who wins the office ‘Fun Committee Award’, which entitles him to a whole day full of fun. He is most reluctant to leave the safety of his cubicle but he has to. Prescribed fun modules have to be completed and non-compliance is not an option… The second story begins with a domineering pater familias, Anil, who is on life support. Seeking some relief, his family decides to buy a TV, which Anil had banned; now every night the family plugs into a popular soap whose hero is a man ideal in every way… The third one centres on Aarti whose repetitive existence is slowly making her more and more mechanical and numb. Deep inside ferments a disconnect and unease that she is unable to articulate to anyone. Then one day there arrives a most intimate letter and everything changes. Ruchika Oberoi is an alumnus of the Film and Television Institute of India. Island City is her debut feature film. 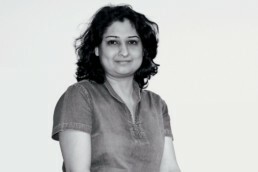 The script of Island City participated in the NFDC Screenwriters’ Lab 2012, which was held in Venice alongside the Venice Film Festival, 2012 and Goa, alongside the Film Bazaar.